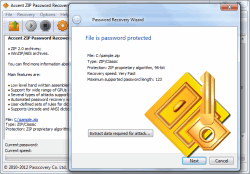 Accent ZIP Password Recovery is the professional tool for recovering lost passwords to ZIP archives, with support for both classic encryption and the hard-to-crack WinZip AES encryption (.zip and .zipx archives). Lightning-fast recovery speeds accelerated on AMD and NVIDIA video cards and a pared-down interface put AccentZPR in a class of its own. Accent ZIP Password Recovery fully supports all types of ZIP archives and recovers the passwords to archives created using any popular software (7Zip, pkzip, WinRar, WinZip and more). The software is optimized for all modern Intel and AMD processors. Accent ZIP Password Recovery uses AMD and NVIDIA graphics cards to boost recovery speeds up to 60 times* with a set of two cards. GPU computing technology are used for recovering passwords in archives with classic ZIP encryption and WinZip AES encryption. The power of modern graphics cards gives an incredible performance boost, and their flexibility, scalability and affordability make AccentZPR the optimal solution for recovering lost Zip/WinZip passwords. Accent ZIP Password Recovery supports three types of password attack, each of which has its pros and cons (learn more). Dictionary attacks are usually the most practical approach, saving time by limiting the search to the most likely passwords. Scenarios define blocks of the most common passwords. The software uses pre-defined scenarios to automatically try common passwords without any user input. Great feature for new users. 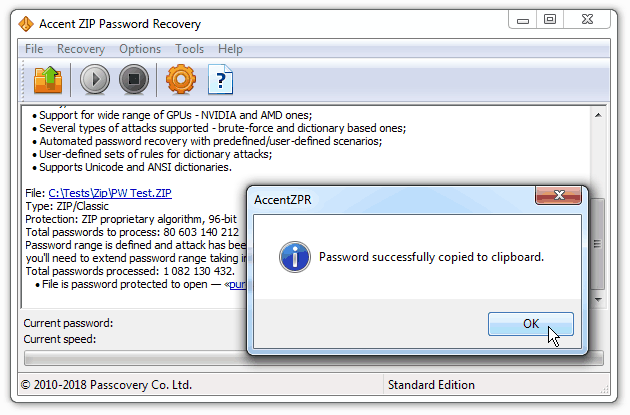 Experienced users can create their own recovery scenarios using a special feature of AccentZPR. Scenarios allow users to define a set of rules that are used by the program to search for the password and flexibly control the arrays of checked values. AccentZPR uses a macrolanguage to describe password mutation rules for dictionary attacks. This makes it easy to tweak passwords, add words and symbols, and combine passwords from multiple dictionaries. 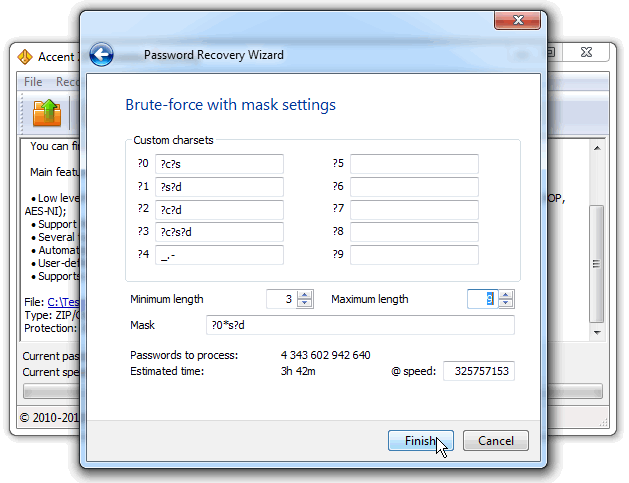 This approach cracks passwords like "pa55word" or "VeryStrongPassword1234" much faster than other options. This option will be useful for forensic computing professionals and law enforcement. AccentZPR has an extended mask function that defines the set of symbols used in each position of a generated password during a brute force attack. The mask makes it easy to rapidly try all the passwords that meet its conditions. Another useful feature for professionals. Accent ZIP Password Recovery is compatible with AMD and NVIDIA graphics cards supporting NVIDIA CUDA and ATI Stream/OpenCL technology. In other words, AccentZPR can run on all modern AMD and NVIDIA graphics cards. All the features of the program are available in our absolutely free demo version. Payment is available via various online and offline methods. The full list of options depends on the region and is available on the order page. All transactions related to license purchases for software are secure and strictly confidential. Recovering a WinZip 14 password using an ATI 5970 graphics card (1,150,000 passwords per second) is 30 times faster than the speed you get using an Intel i7-820 processor (36,500 passwords per second) and approximately 17 times faster than the Tableau TACC1441 hardware accelerator (65,000 passwords per second). **Note that classic ZIP encryption can be accelerated with NVIDIA or AMD 5XXX and above GPUs. See what people are saying about Accent ZIP Password Recovery and share your own opinion. Point102, Japan:“As of Feb 2019, For personal use, this software is the fastest among some famous password recovery software I checked by using the trial. The MAX speed was over 1,100,000,000 at Brute force attack. The Min speed was around 80,000,000. Want to learn how to use Accent Password Recovery products? Find the answers here. Our website contain a AccentZPR User's Manual. Please, learn it. Have a suggestion, question or request about any of our software? Contact our Service Team for a rapid response. * Service Team response times vary depending on request volume, the complexity of a given request and the time of day the request was received. We usually respond within 24 hours Monday through Friday, excluding weekends and holidays. Looking for more? You need Passcovery Suite — a multi-format premium tool for password recovery on AMD and NVIDIA video cards. Passcovery Suite supports Microsoft Office and OpenOffice documents, Zip and Rar archives, Apple and Blackberry backups, encrypted TrueCrypt volumes and WPA/WPA2 handshakes. 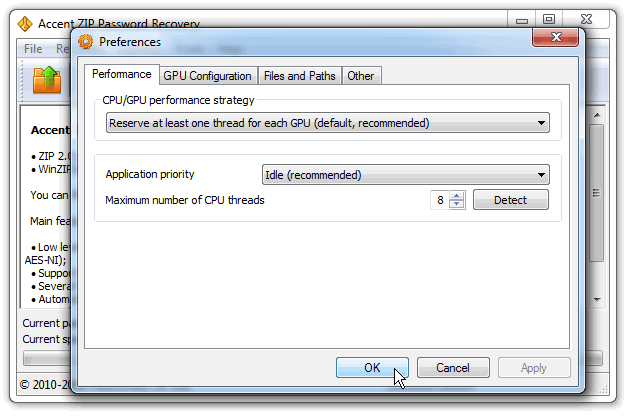 The software works on AMD/NVIDIA video cards and guarantees the highest possible password recovery speed on any computer. NB: Passcovery Suite uses a RAR password recovery module and an interface that are identical to those used in AccentZPR.